Ready for basketball. Ready for a WIN!! 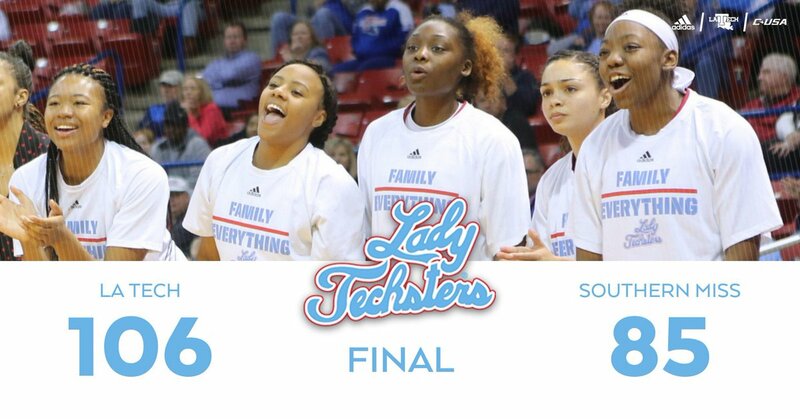 Good to see former Techsters Tasha Crain, Erica Smith, Amber Obaze, Tamika Kursh, Ty Moore, Katie Cochran, and Mrs. Kurt Budke before the game, more coming for halftime, post game. Any of those got any eligibility left? Up 17-14 after a quarter. Nice comeback after a slow start. If Anthony were in a better position to rebound she’d be halfway to a Quad-Double. She’s having a good game so far, lets hope it continues into the next half. 20 points at half, all over the court with steals, assists, picking up contested balls, great energy. Up after third, 76 - 62. Keep it going! I think this one might be in the bag, guys! Great to have such a dominate win with all the legends in the house. Seems too often, after years of neglect of our alumni, we manage to get everyone back home, then stink it up. Not today!! Defense broke down some, but this was a great win with a LOT of energy! Southern Miss had been holding opponents to around 53 points a game before last night. Great game!!!!! Better than the Tech men!! True.... The women seem to be improving every game. Something happens to the men every time they go on the road. It is getting puzzling now.